Intel isn't messing around. 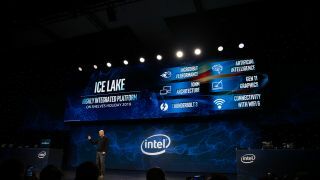 At its CES 2019 keynote it introduced Ice Lake, the very first series of its processors to be built upon its 10nm Sunny Cove architecture. The company didn't just announce the chip was coming – it showed an actual piece of silicon and even performance testing with a laptop powered by the new CPU. The company claimed that Ice Lake chips can search for images two times faster than even a modern laptop. Ice Lake will also be Intel's first chips to come with built-in Thunderbolt 3 integration, Wi-Fi connectivity and Gen11 graphics – the last of which is capable of powering a 4K display. Intel also demonstrated how users will be able to play with its amped-up Gen II integrated graphics. Unfortunately, Intel didn't disclose any setting that they were playing the game at. Dell's president of Client Solutions Group, Sam Burd, also appeared on stage to show that the company already has a working engineering sample equipped with an Ice Lake processor. Intel also announced Project Athena, its ambitious program to push mobile computing to its next era. In its mission, the chipmaker plans to work with hardware manufacturers to develop thinner and lighter products to recapture the thunder that birthed Ultrabooks. Project Athena will be an industry-wide initiative and Intel plans to work with every manufacturer including Huawei, Dell, HP, Asus and Lenovo to name a few. Intel recently announced a new Foveros technology that would allow it to create processors that would pair different types of processor cores into the same chip for a more rounded CPU. Today, we're finally seeing the fruits of this new technology in the form of LakeField chips. LakeField is closer to the processors that power your phone in that they pair big, performance-focused CPUs with smaller low-energy CPUs. With this blend of processor cores, your device will be able to handle all your tasks on demand and save your battery life when it's just on standby. What's more, this chips can act as systems on a chip if they also have integrated graphics, memory and other modules. To demonstrate this development, Intel pulled out a motherboard board fitted with LakeField processor no larger than a Roku Streaming Stick. The 12mm square package (the equivalent of five quarters lined up. Intel Showed off includes a single 10nm Sunny Cove core and four additional Atom cores. Intel ended its LakeField demonstration by revealing two prototype systems, a small tablet system and a more typical laptop. According to the chipmaker, LakeField can scale from low power systems to full PC performance machines.